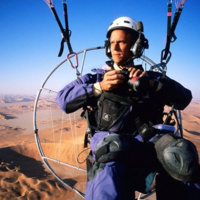 The Digital + Media department welcomes photographer George Steinmetz. Best known for his exploration photography, Steinmetz has a restless curiosity for the unknown: remote deserts, obscure cultures, the mysteries of science and technology. A regular contributor to National Geographic and GEO magazines, he has explored subjects ranging from the remotest stretches of Arabia’s Empty Quarter to the unknown tree people of Irian Jaya.